I’ve always thought Doberman Pinschers looked kind of intimidating… big, slim, fast, and… pointy. Sharp ears, sharp muzzle. Dangerous. It didn’t help that I was knocked around by a neighbor’s Doberman when I was a kid, although even then I knew that that dog, in particular, wanted nothing more than to lick my face. He had pretty hideous breath. This guy was a little more restrained. Quite friendly, in fact, in a not-terribly-attentive sort of way. I suspect he had something else to pay attention to. Obviously an extremely alert dog. 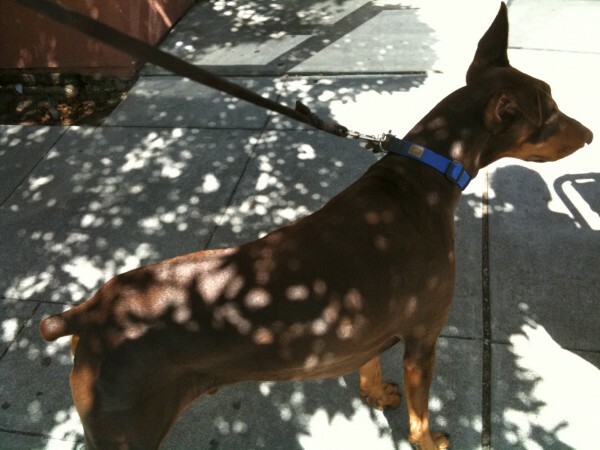 This entry was posted in Dog of the Day and tagged Doberman Pinscher. Bookmark the permalink.